Soil potassium content is a limiting factor of wheat growth and productivity, as it is one of the most important major elements for plant growth. The Need for optimizing use of potassium fertilization using natural amendments is growing up parallel with the accelerating increase in fertilizer prices. 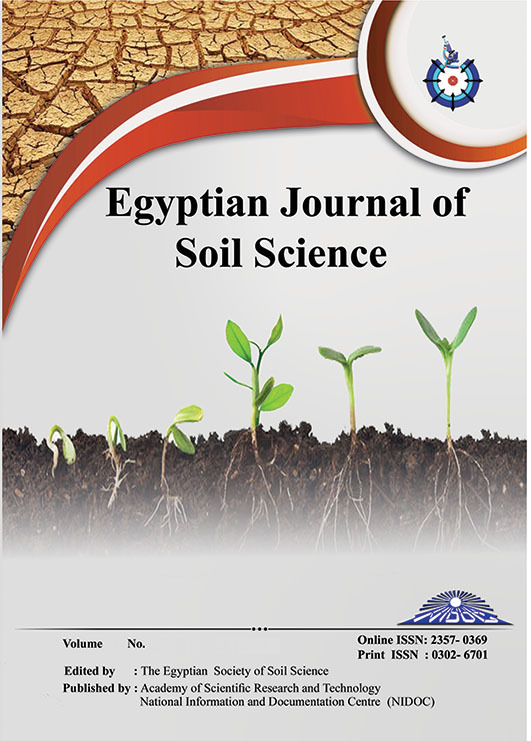 A field experiment was carried out during 2014-2015 growing season in Salehia, Egypt. The aim of the study is to investigate the effect of different sources of potassium fertilizers (potassium sulphate and potassium feldspar) at the recommended rate (95 kg K ha-1) and either single or in combination with organic amendments ,i.e. chicken manure (Ch.M) and farmyard manure (FYM) with silicate dissolving bacteria (SDB) on yield and nutrients uptake by wheat. The results indicated that the highest values of dry matter yield of wheat, biological yield, protein content, NPK –uptake and available potassium in soil were observed at the treatment of (K sulphate or K-feldspar + Ch.M) in the presence of SDB. Dry matter yield of straw and grain ranged from 8.53 to 11.79 and 5.94 to 8.11 Mg ha-1, respectively. Based on thesa results, the available potassium was remarkably increased after 60 and 90 days and then decreased at 150 days at all treatments for application of potassium sources and organic amendments with SDB.